A lthough the Events of Holy Week have already been going on for some days, actual Holy Week in San Miguel de Allende officially begins on Palm Sunday. Today, there's an air of celebration in the air, as people remember Christ's entry into Jerusalem amid the happy shouts of the crowd. The iron fencing in front of the Parroquia are draped with red swags of fabric. At dawn, vendors begin to arrive in front of all the major churches in town to sell palm fronds woven into dozens of beautiful and fantastic shapes—hearts, fans, crucifixes and more, from tiny to enormous. Many are further adorned with purple yarn, chamomile, ribbons, even sequins. They also sell crepe paper flowers, religious icons and milagros of every size and type. The vendors/weavers—mostly indigenous women—sit on the steps, their wares spread on brightly colored blankets, their hands busy weaving the palm fronds as they gossip with friends between customers. Popular with tourists as well as locals, the woven palms make a nice souvenir of the events of Holy Week in San Miguel de Allende. The ones woven from fresh, green fronds will keep well for a long time. Insider's Tip: The best selection of woven palm items is generally found in front of the Oratorio Church on Calle Insurgentes, which has the largest active congregation in San Miguel. The official Holy Week processions begin today with two of them. The best, I think, is the first, beginning at 10 am at the Calvario Chapel at the top of Calle San Francsico. A young man in a rough white tunic (and a beard grown especially for the event) rides a donkey down the hill and through the streets of the centro. Behind him comes a joyful procession of the 12 apostles and dozens of other followers, dressed in costumes that probably see double duty in the Christmas posadas. Amid shouts of "Viva Cristo Rey," the procession continues to the Church of San Francisco. After being met by the clangorous pealing of the bells, the group files in for mass. Now the events of Holy Week slow down a tad. The mid-week observances are heartfelt and lovely, but the feeling of expectation in the air is almost palpable as the major processions, the most important of all the events of Holy Week, approach. 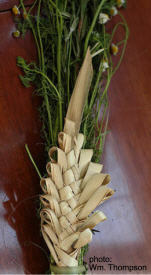 NOTE: For Semana Santa 2012, Domingo de Ramos, Palm Sunday, falls on April 1.